When Jim was told that Maggie, an eight-year-old Labrador, had a life-threatening growth that must be removed, it was devastating news. Jim was a single dad, raising three children by himself since the death of their mother. His income barely stretched around to monthly needs, and the money was just not there for the costly surgery Maggie needed. He could not bear to tell the children that their beloved dog might not be with them much longer. Maggie was distressed and in pain, and they all knew she was suffering. 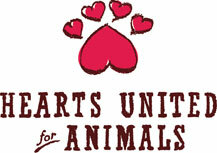 The receptionist at the veterinary clinic advised Jim to call Hearts United for Animals and ask if there could be some assistance. He figured that was a long shot but made the call. The voice on the other end of the line was all business, but Jim knew he had reached a very sympathetic person. Arrangements were made with the veterinary clinic, and two days later Maggie had her surgery. Three happy children went with their dad to bring her home from the hospital. Maggie's bill was substantial but a small price to pay to stop the suffering of a precious dog and the people who love her.